The bridge towers of the great warships of the Imperial Navy exhibit subtle variations which indicate different ship sub-classes or else act as fingerprints to particular vessels. Our present state of knowledge about the structure of the known classes of star destroyers holds that the bridge of the ship is located in the broad hexagonal module at the highest point of the vessel's dorsal superstructure. The tower is sometimes colloquially known as the "head" of the ship. The details of the structure of the command tower vary slightly between the ship classes and between the different models within each class. 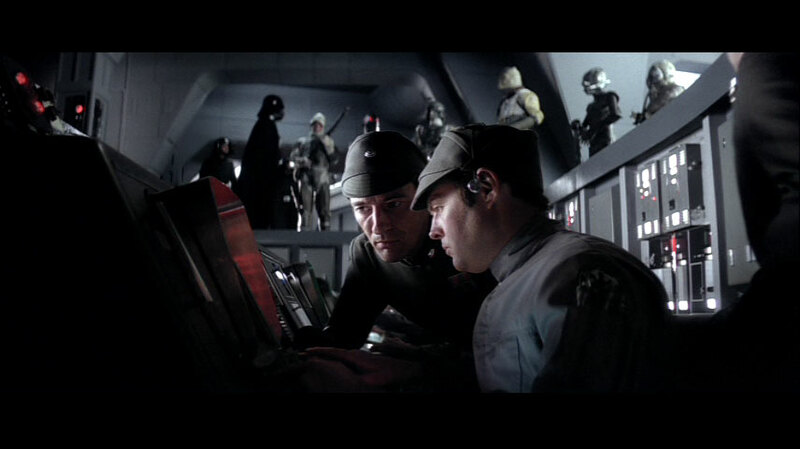 Dan Black for high-resolution screenshots of the Executor tower flyby and a star destroyer tower attack from Return of the Jedi . Robert Brown for the provision of several valuable images, giving me a tour of a real cruiser and a naval submarine, for his helpful advice regarding the analogous structure of STAR WARS vessels, for pointing out the Devastator bridge storyboard, and for a crucial Devastator image. Peter Briggs for detailed comments regarding the nature of the linear array. Jonathan Calvert for more excellent reasoning regarding the status of the scanner globes - a few points which I'd never heard before. S.R. de Bruijn for reminder of the common surfaces of the Avenger and Executor towers. Steve Green for the logic of temporary shield failure. Ansel Hsiao for notes about the ineffect of globe destruction on the shields of Victory-class star destroyers in TIE Fighter . Jeremy Helper for drawing my attention to the Kotiate reference. Darren Johnson for insight regarding the causality of scanner globe destruction and loss of deflector shields. Jess for the bridge plans from the STAR WARS Technical Journal . Mark Miller for discussion and graphical donations, especially for contributions to the assembly of the new tower face comparison diagram. Joe Murray for reminding me about the destroyed scanner globe model in STAR WARS to Indiana Jones . Allen Nilles for pointing out the spray-can illusion. Shay Pierce for the Rage tower face picture. Ethan Platten for verifying my computer game references. Wayne Poe for newer tower images from CINEFEX , and for rediscovering the CINEFEX quotation confirming the role of scannar globes. Anthony Tully for persuading me that this is an interesting and fruitful field of study; for connecting the multi-bridge tower with the communications ship at Endor; for his voluminous discussion; for the asteroid image with the many scanner globes; and for providing many of the images in the first version of this page. David Winclechter for pointing out the designation of the linear array in Behind the Magic . Michael Wong for pointing out a star destroyer which has lost its shields without damage to its scanner globes. Brian Young for providing the screenshot of the "tractor beam targeting array" from Behind the Magic ; for the Alabama photo. Several variants of the same basic bridge tower can be observed in the films. These classes are primarily distinguished by the features of the front face of the bridge tower (although there are also distinctive features on other tower surfaces). The most important characteristics relate to the position and form of the ships' bridges. The faces of the first two classes, presumably the older vessels, are relatively flat and seem to lack large or prominent windows. I call these the flat-faced tower group. The only windows visible are small ordinary portals which appear like point light sources when viewed from afar. The latter two types feature distinctive blister-like nodules on the front face of the tower. For this reason I call these the nodule-faced tower group. These nodules tend to be about twenty metres wide and sport large panoramic triangular windows. These are associated with the observation windows which are known from interior views of the command bridges of Executor and more modern warships. The exposure of the observation nodules in the newer vessels seems to be accompanied by introduction of powerful bridge deflector shields. Photographic composite flat projections of the front faces of the known command tower variants of warships built by Kuat Drive Yards. From top to bottom they are the Devastator-like, and the Avenger-like destroyers; the mysterious multi-bridge tower; and the Executor-class command ship. Three versions of the same diagram are given, with increasing resolution. The various faces are not represented in equal clarity because the source photographs vary in quality and scale. Peripheral details, including the scanner globes, were copied from the ISD-II model to the "ISD-III" and the Executor. This was done because the transformations which flatten and orient the tower faces also distorted the surrounding features. Presently-available images of the Devastator tower face are of poor resolution, so the top projection is slightly blurry. The Avenger and Executor tower faces are known with good resolution, and the multi-nodular tower face has fair detail. 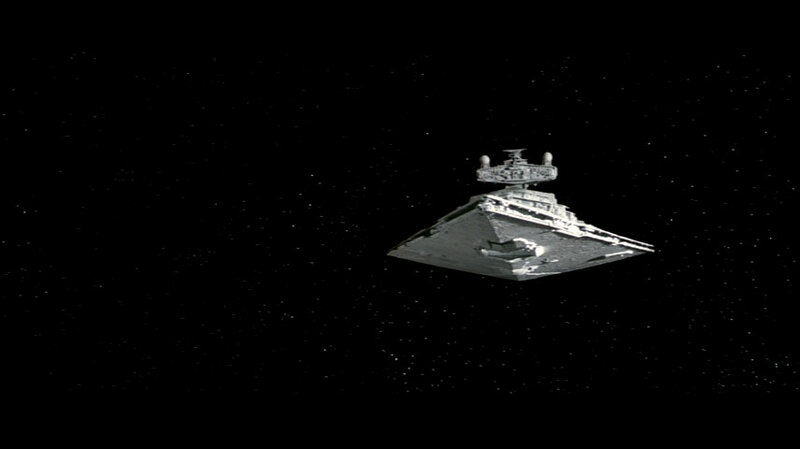 The first star destroyer seen on film was the Devastator, which served as Lord Vader's flagship during A New Hope . The front face of this vessel's command tower is rarely seen in detail but it seems more featureless than the equivalent sections of new vessels in later films. There are few protrusions able to fit anything like the expansive bridge nodule seen in later films. Therefore if the bridge of this ship features large panoramic windows they are probably flat with the front face of the tower. Since no portal lights are visible, the rooms behind any windows on the tower face are probably unlit, more like the shady control room aboard the Death Star rather than the bright bridge area of later star destroyers and the Executor. At this time no clear images of the tower face are available. To date I've obtained nothing better than the blurry photograph used in the tower face comparison diagram above. Note that what appears to be a long horizontal feature in the middle of the bottom of the tower face also appears on the 1978 blueprints for the ship drawn by Geoffrey Mandel, author of The Technical Book of Science Fiction Films . 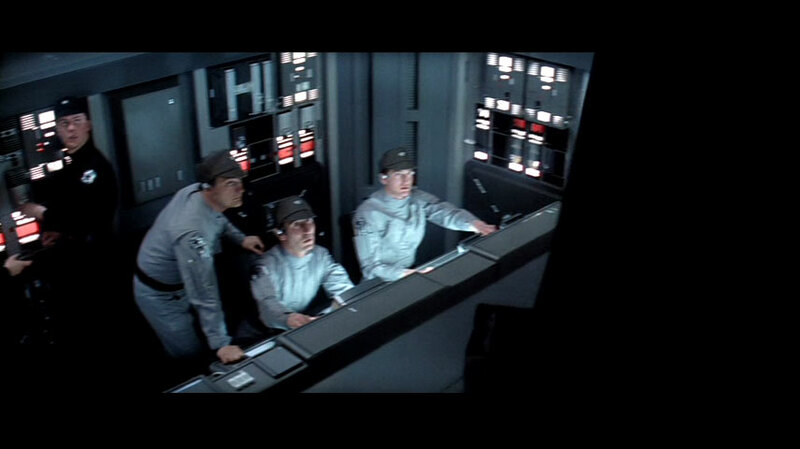 Immediately after the captured rebel blockade runner released an escape pod we see an interior view of what is either a bridge or a gunnery command station. On the ceiling there is a large transverse cylindrical feature resembling the longitudinal cylinders on the ceilings seen in the bridge interiors of other warships in the later films. The room had a rectangular floorplan and featured what was either a window or a large Imperial-standard pentagonal viewscreen. The fact that the escape pod was moving from above the field of view constrains the nature of the room. If it was the bridge (on the top of the star destroyer) then it would be impossible to view the escape pod (beneath the star destroyer) through a window. Either the room was a gunnery station with window on the underside of the ship or else it was in a dorsal location but the "window" was actually a remote display monitor. The novelisation of A New Hope explicitly states that the room is Devastator's bridge and that the ship's captain is present. 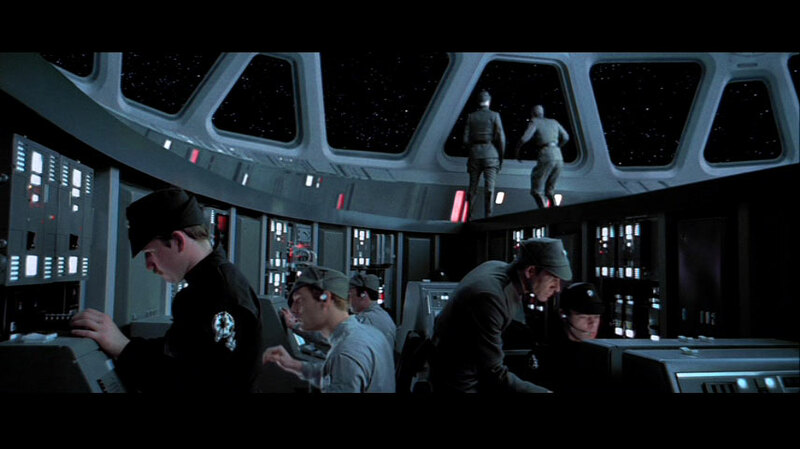 The version of the screenplay presented in The Art of STAR WARS Episode IV: A New Hope does not label the room as the bridge, but indicates that the captain is present and that those present are watching a "main viewscreen", not a window. 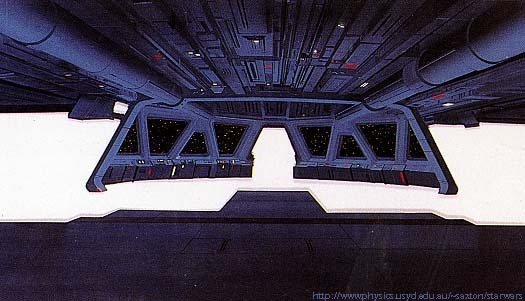 The storyboard art reproduced in From STAR WARS to Indiana Jones does not exactly match the image in the completed film, but it explicitly states that the pod is being watched on a viewscreen. 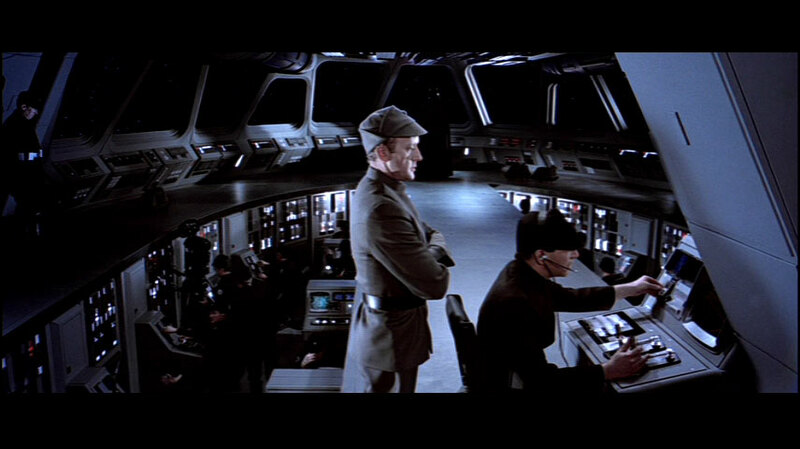 Furthermore, the putative viewscreen is identical to the viewscreen that dominates the control room of the Death Star. Assuming that this room actually is the bridge, or at least that the bridge resembles it, then it agrees well with the apparent absence of large windows in the external views of the front of the bridge tower. There are two possibilities: The bridge is situated at some arbitrary point inside the command module and the panorama is a viewscreen; or the bridge is situated at the face of the tower but it has only one large window, which actually doubles as a viewscreen. A lack of any obvious large portal on external views of the tower would tend to support the internal bridge theory. 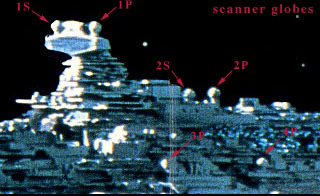 The highest resolution photographs (from STAR WARS Chronicles ) show one dark aperture which is about 9m wide and 7m high, positioned in a location equivalent to the known bridge of the Executor. Therefore it seems likely that there is at least one observation port, but it's unlikely to be the same as the one seen in the interior view (because it has incompatible proportions). The two other star destroyers seen in A New Hope share Devastator's tower structure, as far as we can tell. The two destroyers seen in STAR WARS Holiday Special are also of the same form (which is unsurprising because SWHS recycled footage from ANH ). Therefore all currently known star destroyers existing in the period between the last days of the Imperial Senate and about a year after the Battle of Yavin share these features. This style of bridge tower is probably characteristic of the star destroyers built during this pre-Senate-dissolution period of galactic history. Closeups of the Devastator model, showing command tower detail. Rear view of the Devastator command tower and surrounding superstructure. Bridge and main viewscreen of the Devastator. An excape pod is moving from right to left across the field of view. Devastator in orbit about Tatooine. Devastator returns to the Death Star. Mandel's classic blueprints for the star destroyers of Devastator's type, showing some tower face structure. Star destroyer blueprints crossection indicating an observation window on the tower of the Devastator-like ships. The main bridges of all the star destroyers seen closely in The Empire Strikes Back follow an interior plan which is markedly unlike that of the Devastator. The room is dominated by a semi-circular panorama of triangular windows, each of which is about two metres high starting from a base about one metre above the deck. Set back from the windows are two crew pits full of consoles. The pits are separated by a walkway for the senior officers. The fact that Captain Needa and his senior officers aboard the Avenger dove in fright when the Millennium Falcon flew at them strongly suggests that the triangular vistas are true windows and not simply cleverly constructed viewscreens. This being the case, it is difficult to reconcile the curved shape of the observation platform with the external shape of the bridge tower. All the bridge towers seen in detailed external shots in the events surrounding the Battle of Hoth show a flat-faced design similar to the older Devastator-type ships. The rounded observation area is more reminiscent of the blister-like nodule bridges of newer warships like Executor. The easiest resolution of this apparent anomaly requires inspection of the section of the tower face corresponding to the known location of the command bridge nodule on newer vessels like Executor. In turns out that on the Avenger-like ships there is a fat, vertically elongated, rounded protubence running from the expected bridge location to the upper edge of the tower face. The lower lip of this structure seems equivalent to the main bridge nodule of newer warships. The size of the protubence on the Avenger obscures the windows. Towards the back of the bridge interior there are small alcoves on port and starboard. These alcoves contain computer terminals, presumably for the convenience of the senior officers who walk the observation deck, and what appears to be a triangular window slightly smaller than the main windows. The external bridge geometry of the nodule-faced ships (not the Avenger-type) implies that these are actually viewscreens unlike the rest of the "windows". The argument for is considered in the next section. Views of the face of the Avenger's bridge tower. 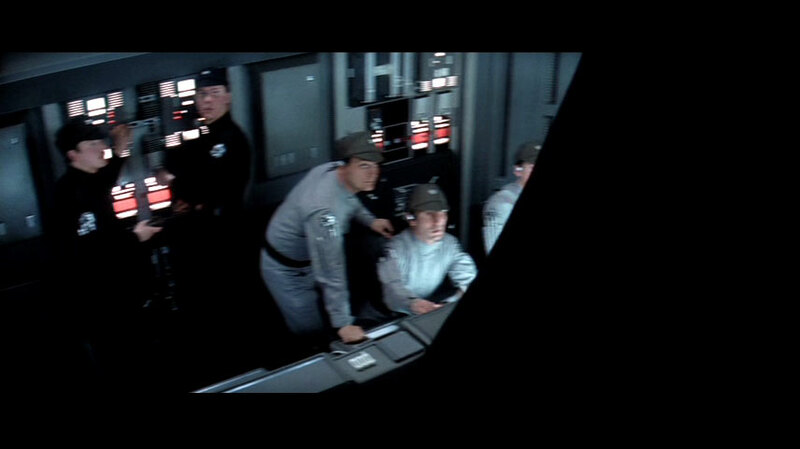 Two officers stand in alcove at the back of a star destroyer bridge. The window which is suspected to actually be a viewscreen appears in blue. 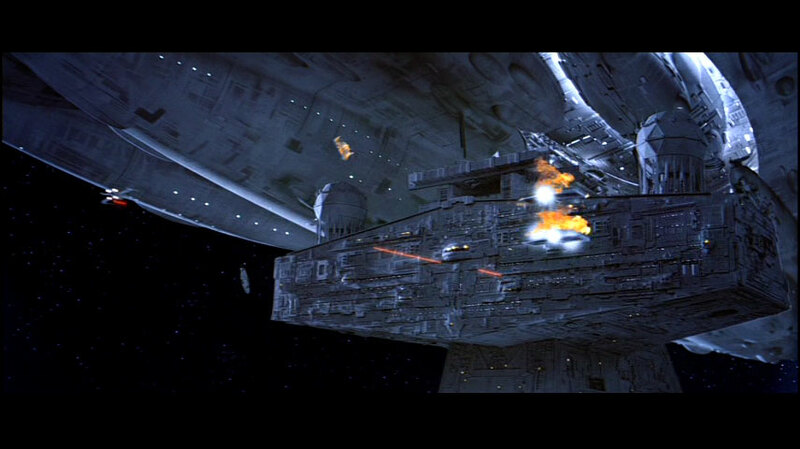 A fair reconstruction of this type of tower face, for the star destroyer Rage in Balance of Power . The placement of features is generally correct, but some parts extend too far or not far enough from the tower face. For instance the vertical wedge shapes on either side of the bridge are much shallower in the movies, and should not surround or hide the bridge altogether. The command towers of some of the vessels seen in Return of the Jedi have a bridge form that is different from the flat-faced models. The most obvious difference is the presence of horizontally-elongated bulges on the front face. These are roughly ten metres thick and vary between about fifteen and forty metres wide. They exhibit rows of large windows which appear triangular in some detailed images. Lord Vader's elegant command ship Executor had only one nodule on its bridge tower, situated just above the centre of the tower face. In the most detailed views available, it can be seen that there are approximately nine windows on this feature, equivalent to the number of windows known on the main window arc of the internal views of the ship's bridge. This independently corroborates the identification of the bridge with this central nodule on all classes of nodule-faced ships. The bridge deckplan is dominated by the rounded area at the front of the room. This curved wall sports nine panoramic triangular windows, each of which spans a height of roughly two metres. The number and character of these windows is indistinguishable from those seen on the externally-visible nodule. Thus the identification of the bridge with the nodule is compelling and perhaps unavoidable. 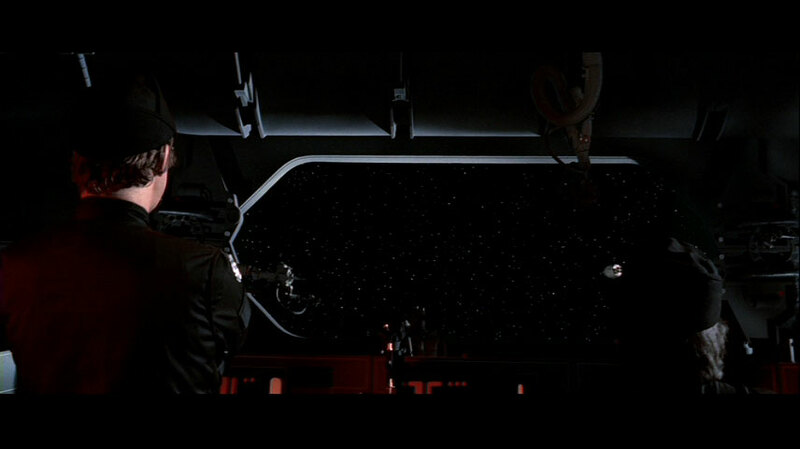 That the interior triangular vistas are true windows and not mere viewscreens is established by the fact that an A-Wing starfighter crashed directly through them at the Battle of Endor, and in the subsequent external view the resulting explosion was seen to spew from the exact place where the nodule had been. Towards the rear of the bridge nodule there is a pair of small alcoves containing what at first glance look like additional panoramic windows facing port and starboard. However the command tower is too long and the bridge interior too small for these to be real windows situated on the actual port and starboard tower faces. Either this part of the bridge is within the bulk of the tower and the "window"" are actually viewscreens displaying starboard/port vistas, or else they must appear at the sides of the exterior bridge nodules. So far no corresponding windows are seen in external views of the nodules, but non-detection is not conclusive evidence of their absence. They may simply fail to appear in the printed photographs becasue the details are so (relatively) tiny and are hidden on oblique faces. 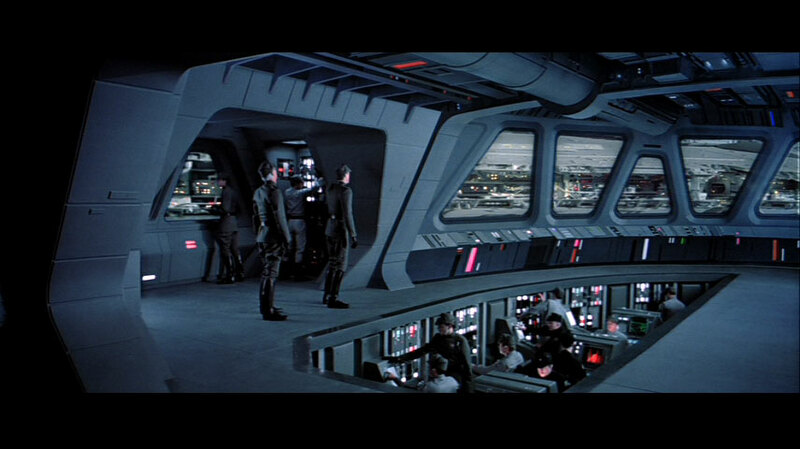 However the prevalence of high-definition window-mimicking viewscreens in the bridges of the Death Star and possibly the Devastator suggests that this is a common design feature of Imperial Navy vessels and facilities. For the sake of comfort and perspective, the virtual windows would be set to simulate the vistas of equivalent real portals. 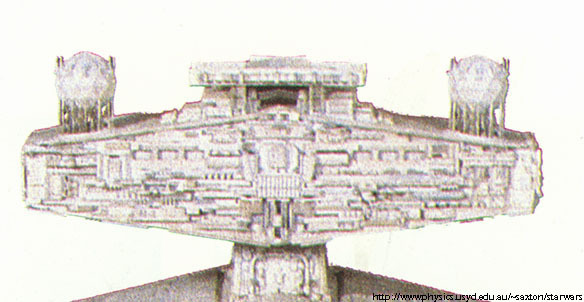 In a direct external image of the front face of the tower as shown in Return of the Jedi , such as the large illustration linked above, the tower face is about 1237 pixels wide and the portion of the bridge hanging out the front of it is about 46 pixels wide. This implies an absolure width of ten or eleven metres, which is consistent with interior views in the movies. 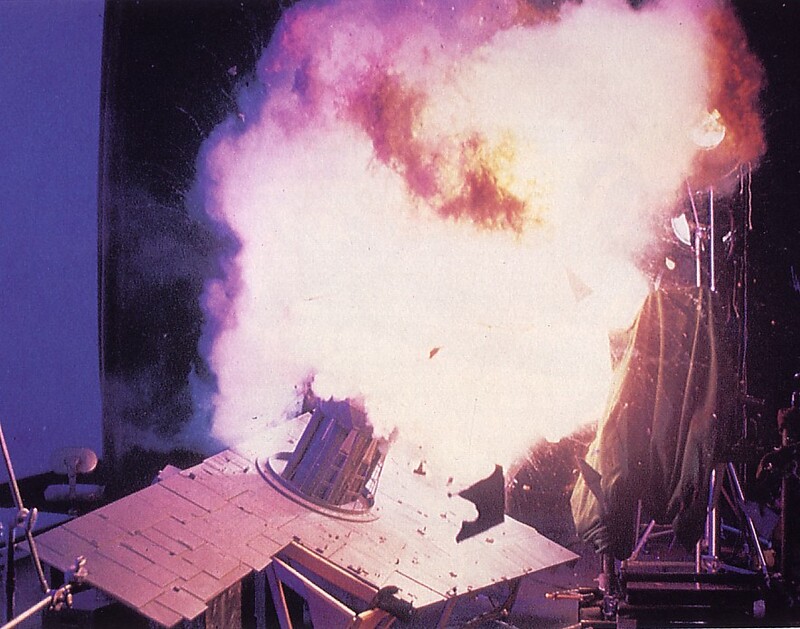 The front face of Executor's command tower, during and after the destruction of one of its scanner globes. Only one bridge nodule is visible, distinguishing the Executor from the communications ship that had many more of them. The first image is especially valuable because it clearly shows most of the portal lights across the front face of the tower. Executor tower model as shown in CINEFEX . Underside of the portside extension of Executor's command tower as the mighty vessel glides past the point-of-view. The illuminated rectangular aperture at the top left of the second image is about twenty metres wide. Its function is unknown, but it seems barely large enough to release a TIE of the kind which shuttled Captain Needa in The Empire Strikes Back . Alternatively, it may serve a kind of cargo transfer function, related to the vertical bulk transit shafts seen inside hangars of the Death Stars. The lower and rear surfaces of the command tower have few viewports, and these are much smaller than the panoramic observation windows of a ships' bridge. Tydirium's flyby past the Executor provides a close and detailed view of the features of the command ship's bridge tower. 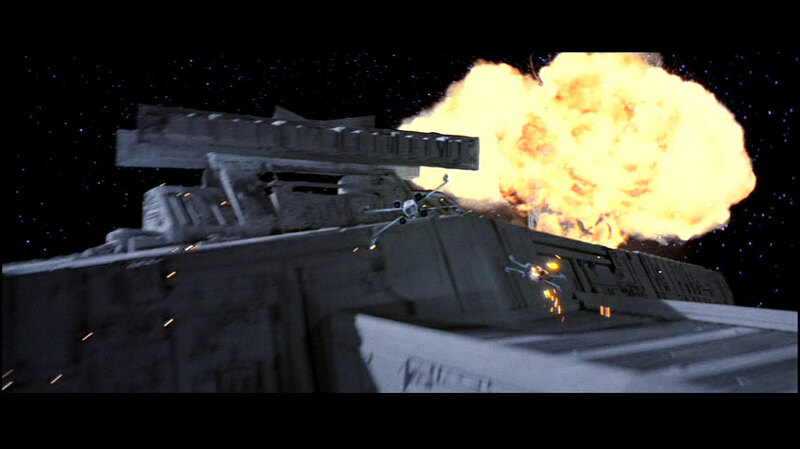 Remnants of an A-Wing enter the Executor's bridge. This interesting tower face has about five nodules of different sizes on various decks of the command module. As with the Executor, we can identify the triangular appatures seen on each ship's command tower nodules with the panorama windows of a bridge interior. However in this case it is not totally clear which of the nodules is the main command bridge. The largest nodule is situated just above the centre of the front face of the tower, in exactly the same position as the lone nodule of the Executor. This central bridge has at least nine windows and it is much broader than the Executor's bridge. Its prominence and position suggest that this is probably the main bridge, and the other nodules are secondary control centres, auxiliary bridges or observation decks of one kind or another. In a direct normalised image of this tower face, the central bridge is 79/1256 of the width of the whole module, meaning an absolute width of over seventeen metres. The interior layout must be very different from the Avenger and Executor bridges on film. The presence of at least five bridges on this vessel, compared with merely one on the Executor, is intriguing but not a dilemma. Warships on Earth usually have multiple bridges or control rooms. The extra nodules may be subordinate or alternate command stations controlling gunnery, propulsion, coordination of starfighters or other vital functions. The occurrence of multiple bridges on this ship's tower face may mean that the vessel is an important flagship or communications vessel which nonetheless lacks potential bridge sites elsewhere on the ship, unlike the Executor with its expansive city-like dorsal cortex. Otherwise it may be that this multi-nodular ship serves a communications and coordination role that exceeding that of the Executor. 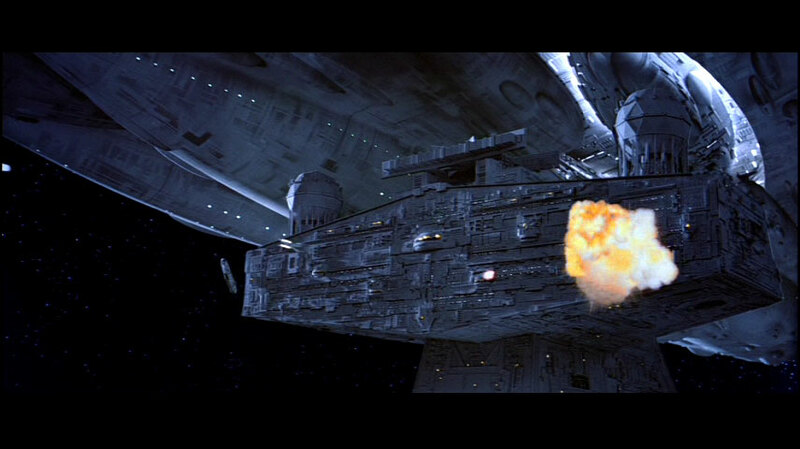 The front face of a star destroyer at the Battle of Endor. 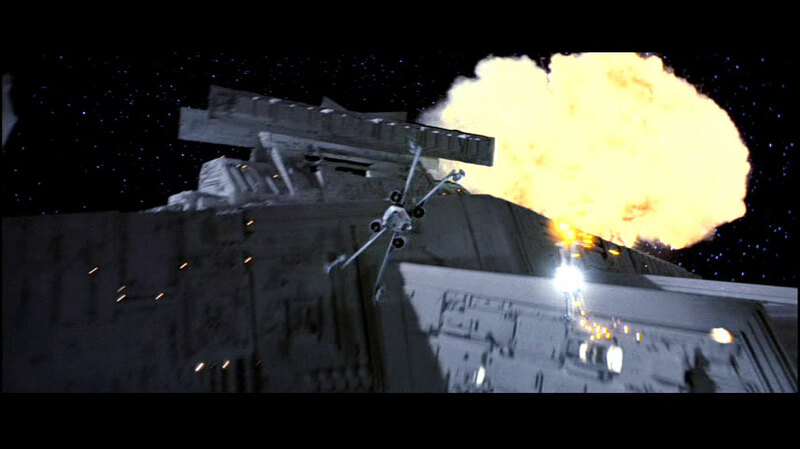 An exploding TIE Fighter is in the foreground and a Calamarian star cruiser is in the background. The bridge nodule is easily seen, with its windows vividly lit. Two smaller nodules can be seen below the bridge on the starboard side. Widevision card displaying the same situation as above. Greyscale images of a model of the mutli-nodular bridge tower. In the first image at least five bridge nodules are clearly visible. The second illustration also shows a can of spray paint, which is unfortunately positioned so that it can be mistaken for another nodule at the lower edge of the tower face. A sequence of images of the multi-nodular tower surrounded by the furies of battle. A bridge of the Chimaera, a common destroyer which was chosen as a makeshift flagship for Grand Admiral Thrawn after his return from the fringes of civilisation. The number of windows clearly exceeds that of an ISD-II bridge, suggesting that this vessel is augmented for superior command and coordination capabilities. It seems likely that this bridge has twice the capacity of an ISD-II bridge. Perhaps it is like one of the more elongated nodules the multi-bridge type of tower. Alternatively, it could be a subordinate control centre elsewhere on the ship's body and not on the main tower. Some of the bridge towers of vessels of different classes and sub-classes share identical or similar features on some of their surfaces, other than the front face. In extrinsic terms, this happened because identical models were used for different ships for some shots in TESB and ROTJ . However in intratextual terms, treating the movies as documentary footage, it is only the onscreen surfaces that matter, and it would not be reasonable to equate conflicting surfaces of different models. Thus although the aft surfaces of the Executor and Avenger towers are almost the same in TESB , the movie does not determine whether the front faces are the same also. 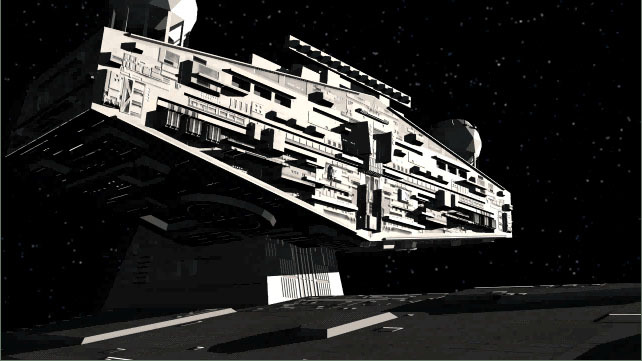 The aft surfaces are seen during the camera flyover by the Executor tower (which is blue-hulled like the rest of the ship) and then on the Avenger when the Millennium Falcon hid on the hull. With regard to the front faces, ROTJ eventually proved that the Executor has a distinctly different face. The aft and underside surfaces of the Avenger tower, according to a SWCCG game card. Underside of the portside extension of Executor's command tower from the flyby at the start of TESB ; the rectangular aperture is the same as that on Avenger. 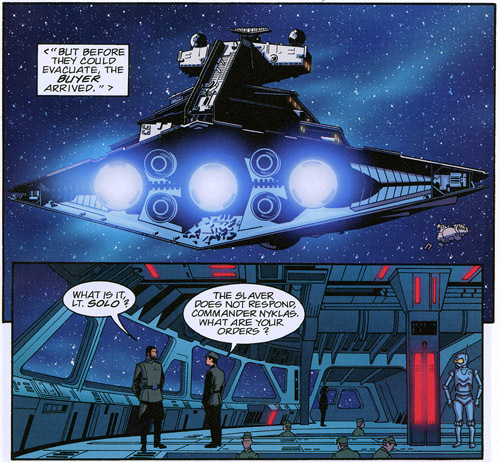 An interesting anomaly: Commander Nyklas's star destroyer is ISD1 subclass according to its external features, but the bridge interior shown in the Chewbacca comic resembles the nodular bridges of ISD2 ships in TESB rather than the more rectangular bridge of the Devastator in ANH . According to an examination of the externally-visible portals, the total number of decks in the standard bridge tower of a Kuat Drive Yards warship is somewhere between twenty and thirty, with an average spacing of about three metres. At a few locations there are portals appearing at intervals halfway between the main decks. Presumably these correspond to inhabited chambers, rooms or shafts which span more than one level. According to presently-available images, the greatest number of decks consecutively spanned in this fashion at any one point is three, on the Executor and the multi-nodular towers. Although the bridge nodules are about ten metres thick in the vertical direction, the scale of the bridge interior is much smaller. The distance between the deck and ceiling is about three or four metres for the command walkways and about one and a half metres more for the control pits. Although this is quite spacious, it amounts to just over half of the total thickness of the bridge nodule. The externally-visible windows are close enough to the bottom of the nodule to rule out the existence of any deck below the bridge but there is a substantial space above the bridge level. We could postulate the existence of a windowless deck above the bridge proper, but it would be cramped. The rest of the nodule's space above the bridge ceiling must be filled with something other than living space. We're faced with the prospect of just a single deck with generous space surrounding it. This may hold life-support, computers and the powerful bridge deflector shield generators. The thick cylindrical structures running along the bridge ceiling also indicate some kind of important mechanism being carried out in the ceiling. 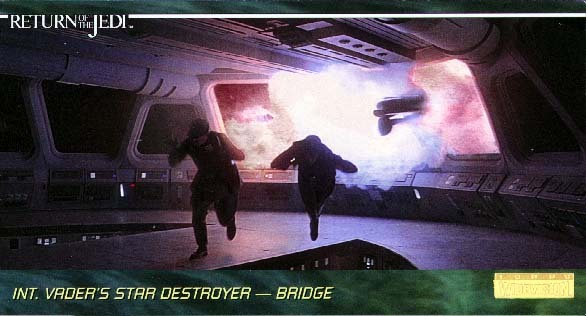 It seems most probable that the cylinders are power conduits associated with the bridge deflector shields. If the extraordinary thickness of the structure above and below the bridge is not due to the bridge shields or other unusual requirements of the bridge systems then we may have an important clue regarding the general nature of the starship technology of the Galactic Empire. If the spacing between decks on a star destroyer is consistently ten metres then we also stand a good chance of being able to calculate limits on the total deck area of any particular class of warship. Design sketches for two views of Executor's bridge interior. Immersed in his disappointment and grim introspection, Lord Vader turns from the windows of Executor's bridge and retires to his quarters after his son narrowly escaped to hyperspace from Bespin. This shot gives us a great view of of the form and extent of the warship's bridge interior. 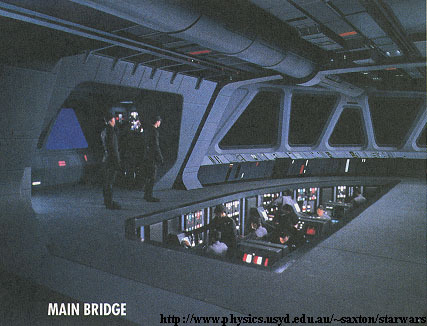 Matte painting of the Executor bridge. 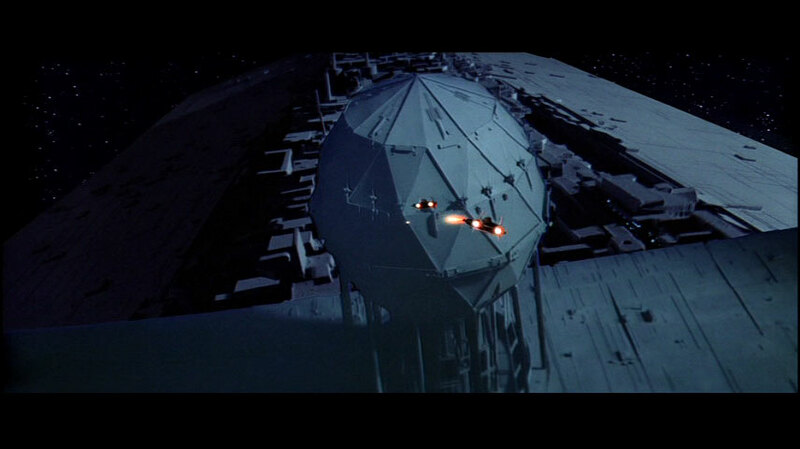 Many people assume that the two globes set atop the command tower of a star destroyer are deflector shield generators. This is almost certainly wrong. The best evidence indicates that they are sensor systems instead. 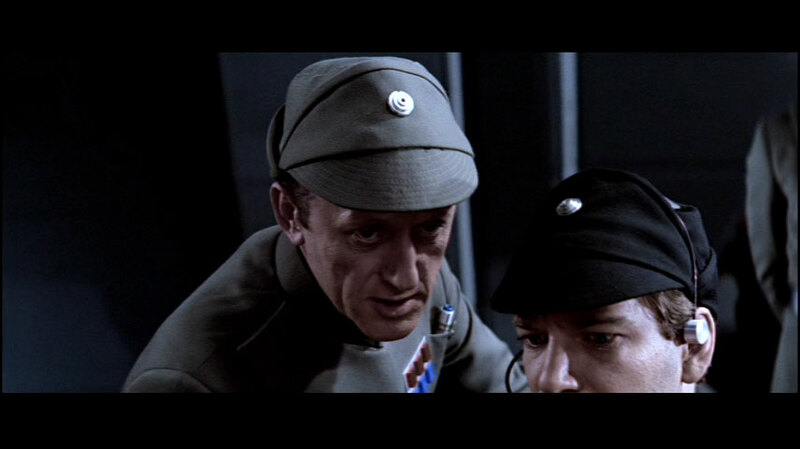 At the climax of the Battle of Endor a concerted A-Wing attack led to the explosive destruction of one of these globes on the Executor. This damage also coincided with a breakdown of the bridge deflector shields, which is the reason for the common prejudice regarding the function of the globes. On all other starships the deflector shield generators are hidden internal devices. They do not need to be perched up high away from the main hull. If the star destroyer globes were deflector shields or if shield generators took any advantage from being prominently placed on a vessel's outer hull then we would expect to see similar structures on rebel capital ships and other vessels. We do not. The domes must be some non-critical system which can afford exposure in a vulnerable location. Furthermore, if the globes really were deflector shield generators then they would themselves be sufficiently shielded to withstand missile attacks from mere starfighters. The failure of Executor's bridge deflector shields coinciding with a globe's destruction may merely indicate that the damage to one system affected power to the other in an unanticipated way. Note that only one of the globes was damaged. If the globes on the command tower were the actual shield generators then both would have to be damaged or destroyed before the bridge shields were wholly lost. (It should also be noted that the globes on the bridge tower were only two out of at least eight that can be seen in that neighbourhood of the dorsal hull.) At best, Executor's demise says more about a flukey and synergistic system failures than any functional connection between globes and shields. In other words, the shield failure was probably due to a power loss which was the deliberate result of the rebel heavy ships' bombardment. In fact it might only have been only a temporary shield failure, with the generators taking some time to recharge. The damage to the globe may have indirectly contributed to the ship's vulnerability, insofar as it might hamper raising the shields again once they were already down. The destruction of one scanner globe was a sign that the bridge deflector shields (which would otherwise protect the globes from starfighters) had already failed. This is a demonstration of Executor's vulnerability, not the cause of it. 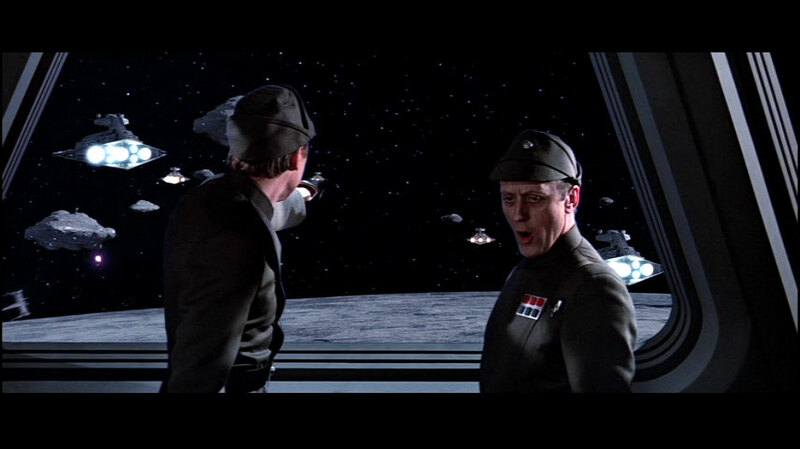 Furthermore, there is evidence of at least one warship at the Battle of Endor which lost its bridge shields even though its globes were completely intact. This was one of the vessels with multiple bridge nodules on the face of the command tower. (It may be the intermediate-sized "communications ship" described in the novel.) 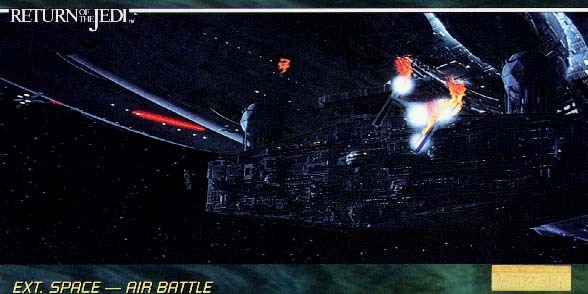 In the closeup footage of the battle around this ship there are great gushes of flame coming from inside most of the bridges, exploding out into the void. Even though the shields are completely lost and the bridge regions have obviously been devastated by rebel bombardment, the globes atop the tower are serenely unharmed and presumably fully functional. Although they're only second-order evidence, it is interesting to note that the official non-canon sources are divided. The roleplaying game seems silent on this matter. Computer games introduced the whole "shield globe" idea as a simplistic means of making large warships vulnerable to the player starfighters. However globe destruction was not always effectual in the games, eg. they don't alter the shielding of Victory-class destroyers. Essential Guide to Vehicles & Vessels and the SWCCG cards followed the computer games, but STAR WARS Incredible Cross Sections indicated that the antenna/globe area is concerned with targeting. Some novels attribute shield functions to the globes, while others call them "sensor domes." To deduce the real purpose of the globes we must consider what functions of a starship actually would benefit from the high vantage of the top of the command tower. The fact that the location gives clear line of sight into space over a maximal angular field suggests a particular type of sensor system which is is blocked by the bulk of the vessel. Sensors of at least some other starships are in similarly prominent positions, eg. the sensor dish on the Millennium Falcon. 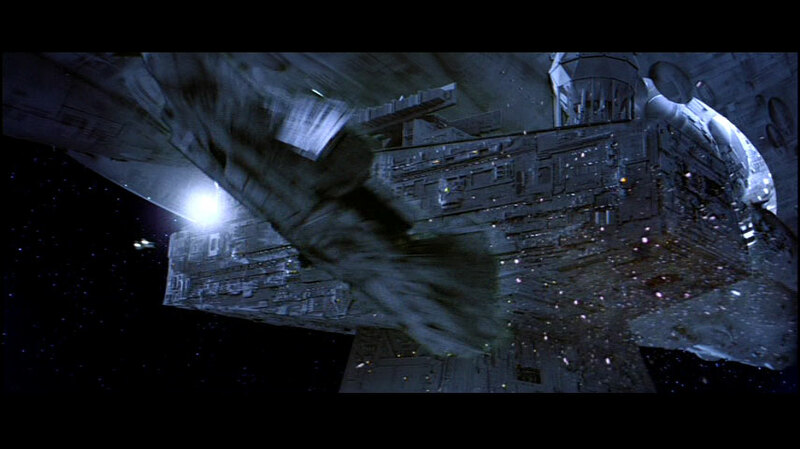 Nobody dares to suggest that the Millennium Falcon's dish is a deflector shield generator. On Earth military/naval sensor and communications dishes are often protected within polyhedral domes which closely resemble those of star destroyers. The surface of the globe is composed of a material which is transparent to the energy employed by the antenna within. An example is the 4MW radar of the AEGIS tracking system featured on the US Navy's Ticonderoga-class 172m guided-missile cruisers. It is likely that the star destroyer globes are analogous to these, albiet using forms of energy far beyond those known to our science. The common physical function of scanner-type devices in our world and in STAR WARS give rise to similar structures. Mandel's 1978 Star Destroyer Imperator Class blueprints corroborate the designation of the globes with a sensory function. His work appears to be just as "official" and Lucasfilm-approved as the divergent reference material which appeared in the late 1980's through to present. The blueprints label the globes as "long-range scanners". Smaller-scale short-range scanners are probably distributed across the rest of the vessel's surface. Positioning of the main scanner globes high atop the command tower has the effect of minimising long-range blind-spots. Lines of sight are uninterrupted in as many directions as possible; the emissions of the scanners are well away from most of the ship's bulk. However the tower globes cannot access all of the sky. Unless there are more scanners on the underside of the ship, there will be blind arcs across ventral directions. In the escape from Hoth, Han Solo launched his starship into a strafing run across the surface of the star destroyer Avenger and hastily parked on the aft face of the command tower. This manoeuver makes best sense if the globes are the major scanners of the vessel, because Solo's landing site is one of the few sheltered blind-spots (apart from possible locations on the ventral surface). By moving into the blind-spot when the bridge crew were distracted by the threat of collision, the Falcon vanished from the scopes. The particular uses of the globes may include the provision of targetting data for the ship's turbolaser batteries and other weapons systems. This would account for the rebels' repeatedly determined attacks on the globes of multiple Imperial ships during the Battle of Endor. Elimination of scanner globes dramatically reduces the accuracy of the Imperial warships' otherwise superior firepower. (Of course the real reason might instead be the fact that the globes are delicate enough to be vulnerable to starfighter fire, unlike most other parts of a huge warship.) Admiral Piett's immediate order for an intensification of firepower may partly be a recognition of the perilous damage to Executor's gunnery systems. 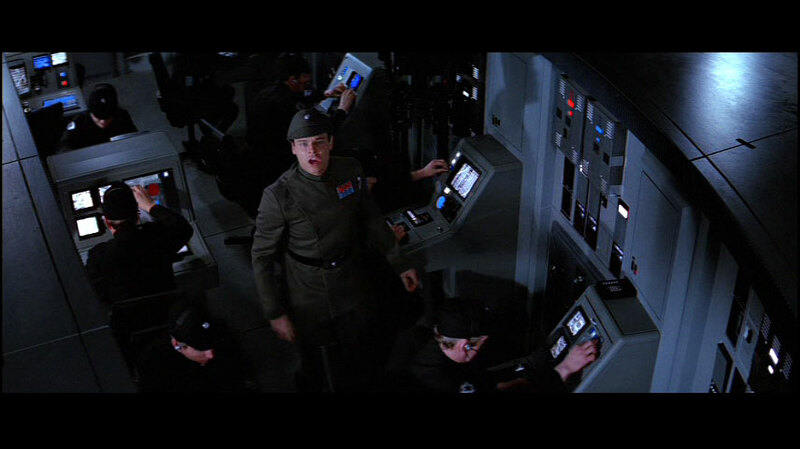 In accordance with its enhanced command and control capabilities, the Executor and other vessels of its class possess at least three pairs of scanner globes in addition to the conventional set on the bridge tower. One set are placed about half a kilometre behind the bridge, on the dorsal surface atop twin cylindrical towers. The spacing of these globes is equal to that of the couple on the bridge tower. There is no linear array between them. This implies that the globes operate independently of the linear array, dependently on a partner globe, and that the globes' spacing is an important characteristic of the function and physics of these devices (probably due to the exploitation of some kind of interferometric technology). However the separation distance isnt restricted to a constant value, because the other known pairs of globes are more widely spaced, sitting generally downhill and outboard from the command tower. These supplementary scanner globes may help ameliorate the sensor shadow cast by the long fantail of the command ship, increasing the aft sky coverage by a few percent. They also cause a dramatic reduction in the number of sensor blind-spots near the hull, especially in the crevices of the crenulated dorsal terrain and on the sides of the bridge tower. However hull shadow considerations probably are not a primary concern, since the globes' size implies special long-range capabilities (which are not available on smaller vessels like the improvised warships of the Rebel Alliance). Nor can the extra globes be a mere backup system, because their placement is not as advantageous as those on the command tower. The most likely reason for their presence is that these larger starships have more power and space available to sustain these useful devices. The potential to direct the operation of one set of globes at a different part of the sky to the primary set must naturally improve the strength, range and overall effectiveness of the sensor system. 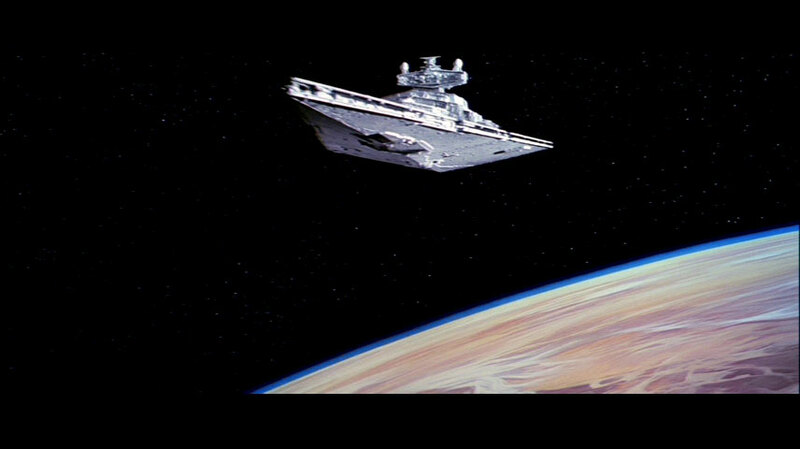 Studies of the proportions of the star destroyer models reveal that the sensor globes have a diameter of approximately 41m. Wayne Poe has provided a crucial quotation. This quote comes from the professional report of Richard Edlund about ILM's work on Return of the Jedi, in the journal CINEFEX in 1983. This is a primary, contemporary source. There is no more authoritative source on ROTJ . 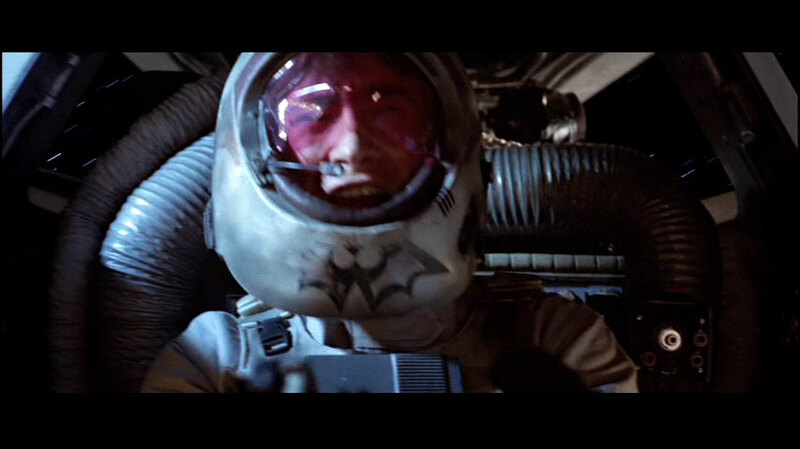 We're also still working on the sequence where Mad Max crashes his A-wing into Vader's ship and causes the star destroyer to lose control and crash into the Deathstar. The penetration shot with the mushroom-cloud explosion we've had for some time, and we've got the shot where the ship's been hit and is starting to heel over. A very large explosion is coming out of the bridge area and it's causing several others to go as well; and one of the big radar domes up on top has been blown away, and that's spewing flames. It's pretty spectacular. Between that sort of closeup of the bridge section and the long-shot of the surface, we need two more cuts of the ship continuing to heel over and dropping towards the Deathstar like an arrow. We've shot a number of elements on those - explosions and things that have to be projected onto the miniatures - and so they're pretty much ready to go. Don Dow will be shooting those tomorrow. — Richard Edlund (who shared ILM's 1983 Academy Award for ROTJ special effects). The intention of ILM and the depiction of the movie no longer show any ambiguity. The globes on the Executor's tower are "radar domes", i.e. scanners, just as their location, form and real-life naval counterparts have always implied. Now we have absolute proof, above and beyond any contradiction posed in second-generation spin-off products. The loss of a globe on the Executor was not the cause of shield failure, but rather an opportunistic attack permitted by shield failure occuring moments earlier. 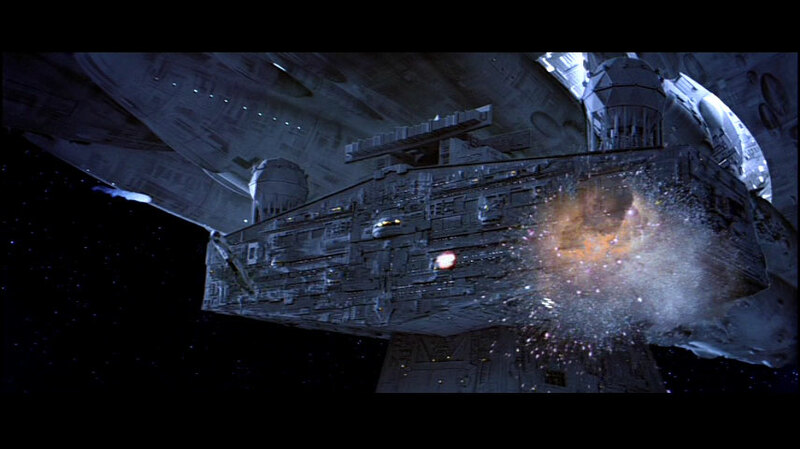 The naïve "testicle theory" of star destroyer vulnerability (i.e. globes primarily as "shield generators" yet somehow unprotected by their own emissios) is effectively dead and buried. "This mission recreates the last time an Imperial class Star Destroyer was destroyed by taking advantage of its 'Achilles' Heel.' After this the remaining vessels in the class were all subjected to a time-consuming and expensive shield system upgrade." 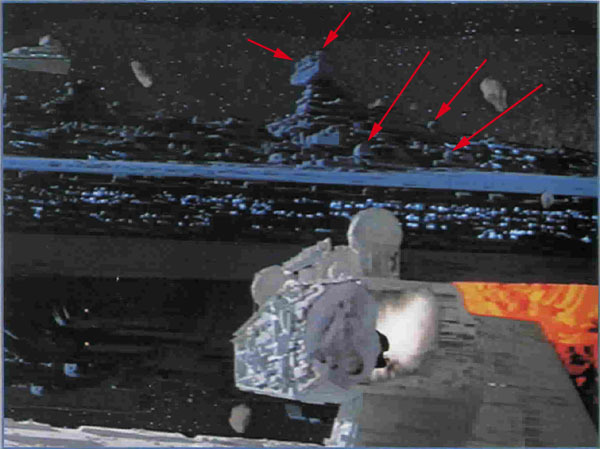 The briefing identifies the scanner globes with shield generators, on a star destroyer named Kotiate. This reference is not absolute canon, and could be disregarded to the extent of its inconsistency with the films and the Return of the Jedi novelisation. However a deliberate attempt to salvage the continuity of this part of the game might follow this kind of reasoning: The design modification took place before the Battle of Hoth (as indicated by the chronological placement of the computer game). The globes' primary function always was the scanner role, as proven by the fact that they look exactly the same in new and old versions of the destroyer. Shield generators might have been mounted on or within the globes as a secondary feature. The globes' supposed vulnerability still requires special explanation; this is not entirely clear. Dubious. Perhaps some kind of asynergy between shields and the scanner beams? Mandel's 1978 blueprints for the star destroyers of Devastator's type, indicating the globes as having a sensor role. 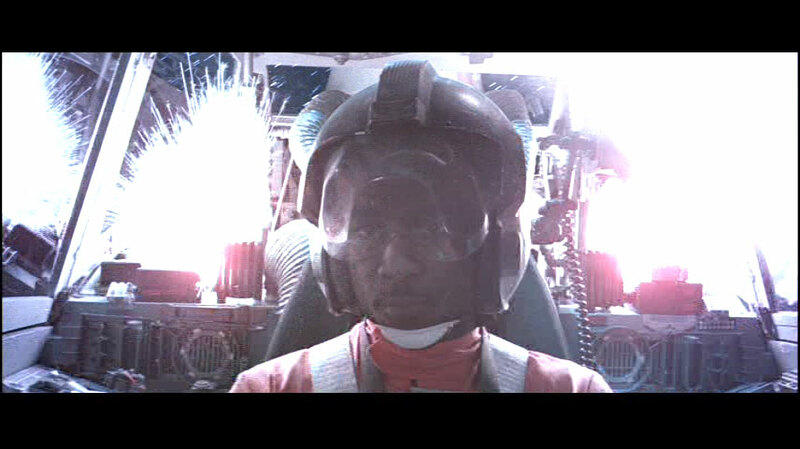 Rebel fighter pilots at the Battle of Endor took delight in blasting off delicate extraneous equipment on enemy vessels which were otherwise unassailably huge. This destroyer has lost a sensor globe to a combined X-Wing and Y-Wing attack. The rebel pilots were promptly dispatched by defending TIEs. 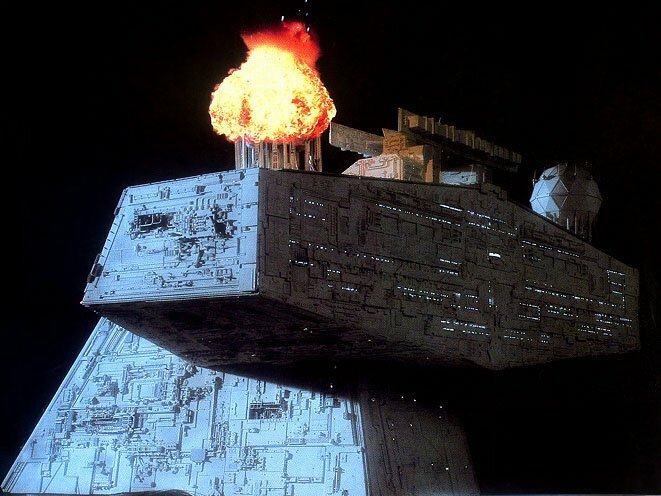 Gouts of flame glow and spew from the ruined bridges of this unshielded star destroyer; the globes on top of the tower are undamaged. Unfortunately the flickering of the flames in the viewports is much easier to notice in the movie than in this still photographs. Watch the videotape to witness it for yourself. 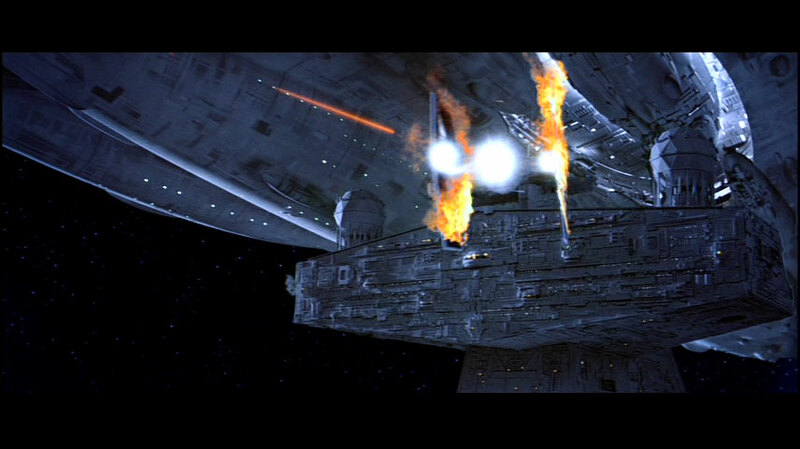 Once concentrated fire from the rebel cruisers had brought down the Executor's bridgedeflector shields, two A-Wings took the opportunity to bombard the tower's port sensor globe. Reducing the commandship's scanning capability handicapped her targeting. Unlike star destroyers, the Executor has at least five pairs of scanner globes. There's a conventional pair on the standard command tower, and another two globes situated several hundred metres behind it. These are arranged with the same mutual spacing as the bridge globes. Three more pairs are in the tower vicinity but further outboard. 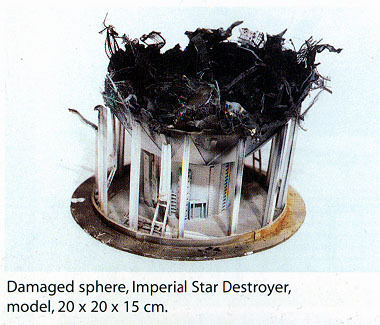 Detail of the model of Executor's destroyed scanner globe. 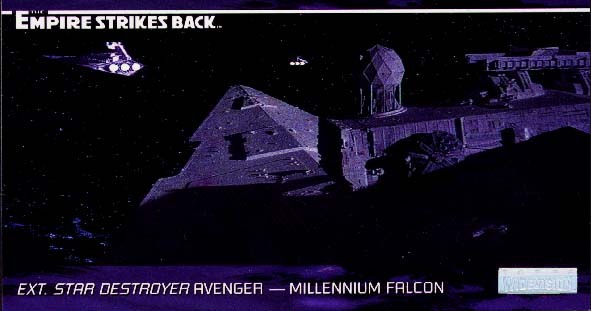 Topps Widevision card depicting the Millennium Falcon perched atop the Avenger's bridge tower, near one of the globes. 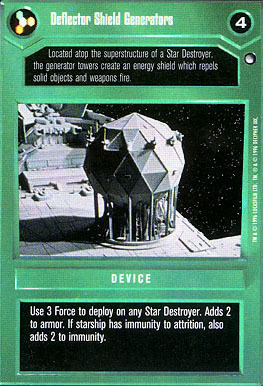 SWCCG card depicting what looks like a star destroyer scanner globe reiterates the error of some other recent sources misidentifying the function of this feature. The USA's World War II battleship USS Alabama has radar dishes and antennae on either side of its bridge. The analogy to the sensor/bridge design of Imperial warships is obvious. Situated between the long-range scanner globes there are two large stubby towers about thirty to fifty metres thick. Across the tops of these towers is a feature consisting of two long linear structures joined by an "X"-shaped brace. In form it resembles a kind of large linear antenna. Its position atop the bridge tower suggests that, like the long-range scanner globes, it serves a function for which an uninterrupted line of sight over most of the sky is the prime consideration. In other words, this also seems likely to be a device for communications or sensor functions. This array is another possible indicator of different classes of Imperial combat starships. On the ISD-I ships the array is usually mounted high and tall, protruding well above the height of the sensor globes. On all the later vessels the array is always more compactly and discreetly settled below the scanner globes in a horizontal orientation. Whether this indicates a difference of the capabilities of the ship subclasses remains open to speculation. 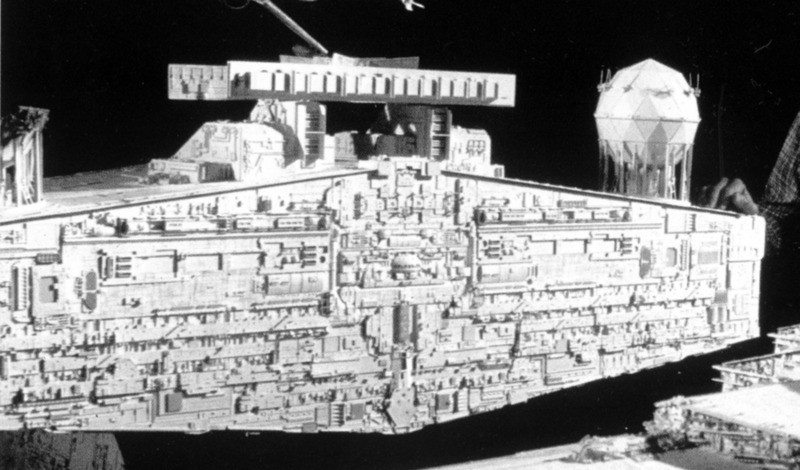 It is interesting to note that the ISD-I destroyers engaged in the siege of Hoth had lowered arrays too. This may be the result of a modernisation refit, or a mission-specific modification; or the array may actually be jointed and directible. The upright stance may be better for tracking (eg. as the Devastator must have tracked the jump trajectory of Tantive IV to follow Princess Leia to Tatooine), or for communications (perhaps the upright mode indicates that the hyperwave transceiver is active). 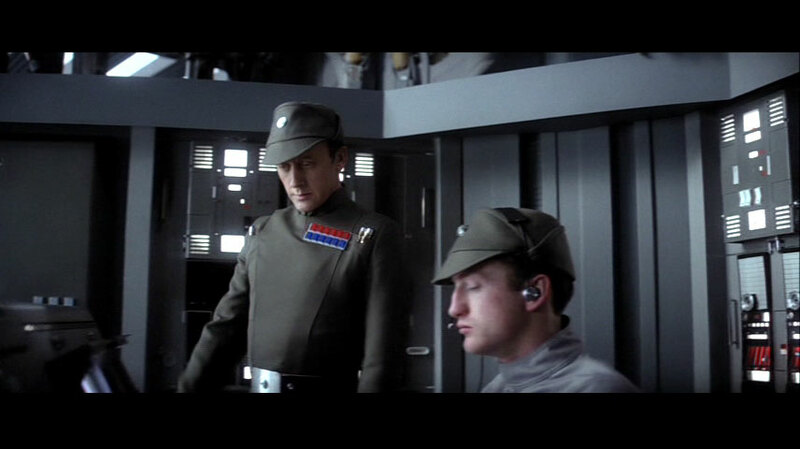 Alternatively, the upright mode may be used for communications jamming, employed to prevent Tantive IV from transmitting stolen plans, for instance. Another possibility is that it's a hyperwave transceiver. These are trans-galactic faster-than-light communications devices which are so expensive and energy-consuming that only medium- to large-sized Imperial warships and fixed facilities are able to mount them. Few technical details have yet been revealled about hyperwave communication, except that in some circumstances intervening matter (like that asteroid field in The Empire Strikes back ) can reduce the clarity of very long-range transmissions. This hints that hyperwave devices should be an external device, preferably mounted on a high position, and therefore should be identifiable with some kind of feature on star destroyers and the Executor. One less likely alternative interpretation [which has been published in the visually elegant but technically self-contradictory book STAR WARS Chronicles ] is that the array is a tractor beam projector. However this would not explain why all the destroyers seen in the days before the Battle of Yavin had their arrays in the upright position. Indeed the top of the command tower is a very poor location for a piece of apparatus which is vital to docking functions; the proper place for a tractor beam projector is near the docking bays or the hangars inside them. 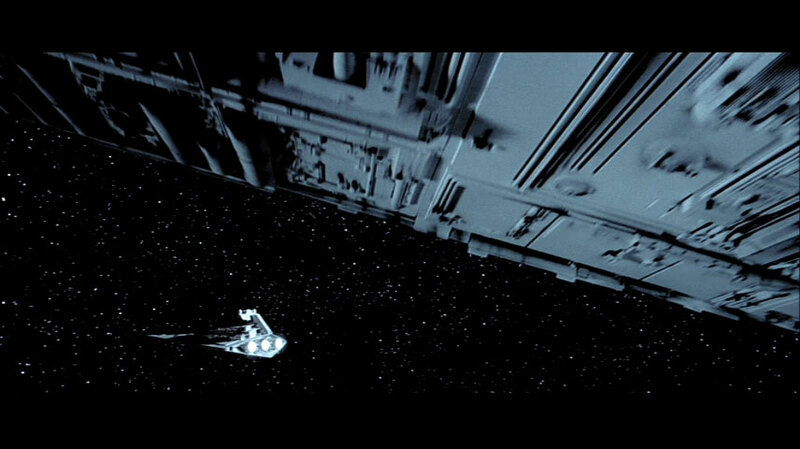 When capturing and reeling in the Tantive IV, there was sometimes no direct line of sight between the corvette and the tower of the star destroyer Devastator. 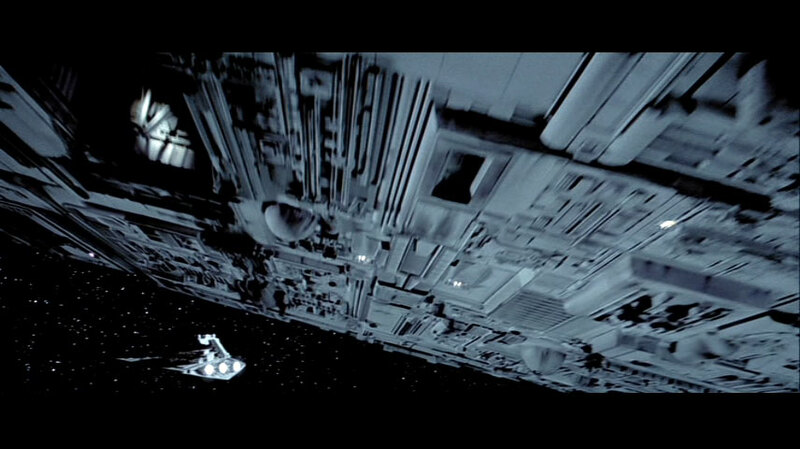 Conversely, the Avenger's linear array was down when it sought the capture of the Millennium Falcon, a time when the tractor beams ought to be most active. The tractor projector interpretation is certainly false or at least incomplete. Newer references, Behind the Magic and STAR WARS Incredible Cross-Sections , soften the tractor theory. It is now described as a "tractor beam targeting array". This proposition makes more sense of the similarity between the array's positioning and what would be expected for a sensory/communications device. The fact that it doesn't have a line-of-sight to the docking bay area is still a problem, but it could be rationalised if the array is merely responsible for tracking targets at long range, separate from the manipulative tractors that take effect close to the docking facilities. Whatever the precise function of this array, it seems to be independent of the operation of the scanner globes. As noted above, the Executor-class ships possess several pairs of globes in addition to those on the bridge tower, and only the basic tower globes are accompanied by a linear array. The Devastator in orbit about Tatooine. Mandel's 1978 blueprints for the star destroyers of Devastator's type, indicating the linear array as a tracking device. 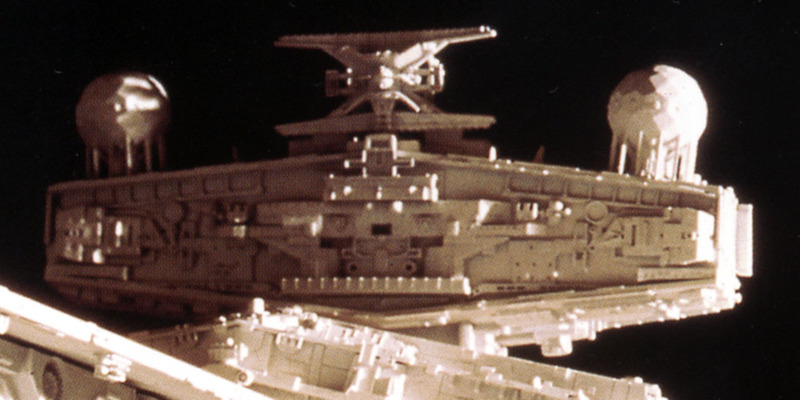 Curiously, the structure of the array does not look like that of any of the ships of any of the films. In particular it has one central support rather than two on its ends, and it is smaller than either of the arrays seen on film. Presumably this shows the influence of an early A New Hope production design sketch. 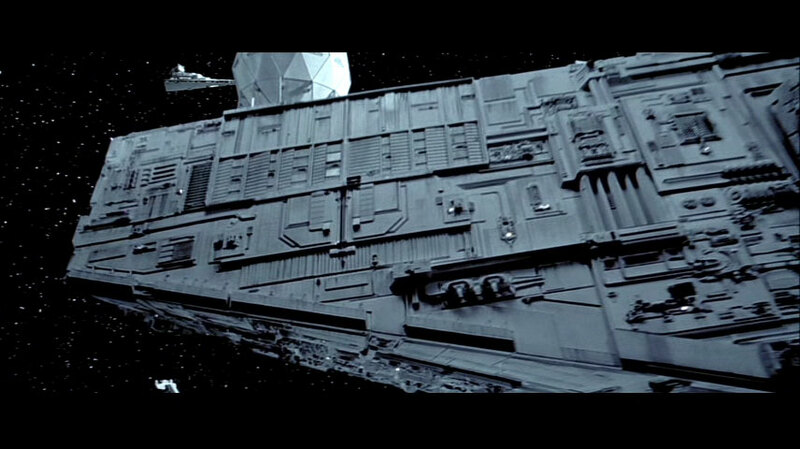 A star destroyer at the Battle of Endor exhibits the more compact linear array common to the newer models. It is generally acknowledged that the tower on an Imperator-class destroyer is the same size as that of the Executor. This structure performs the same function on both ships, and the requirements of these functions do not vary with the total size of a vessel. Furthermore the two types of bridge towers share the same basic proportions, and most of their structural detail. 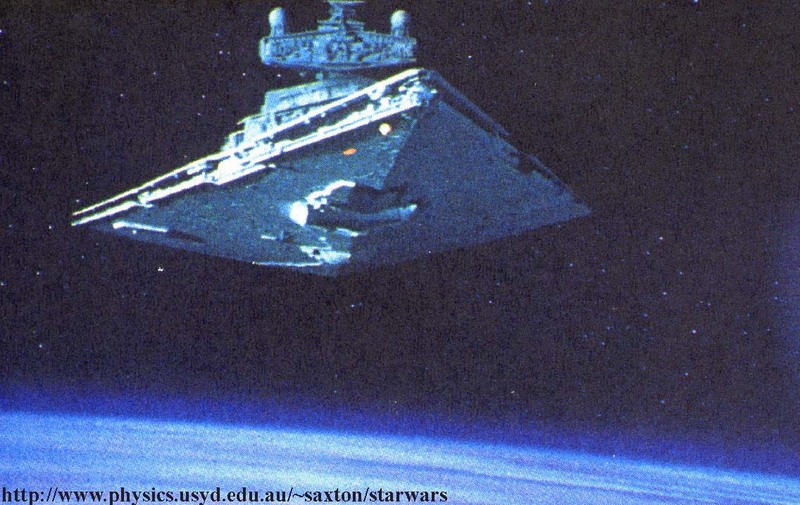 Calculations of the length of the Executor starting with the assumption that the bridge towers are the same size are in close agreement with independent length estimates based on the geometry of images in which a star destroyer overlaps the command ship. It seems clear that the artists responsible for the films intended the bridge size to be a constant, thereby giving the audience a visible and uniform cue to the scale of the ships. The only doubt arises from an comparison of the sizes of the bridge nodules. The Executor bridge seems to be slightly less round and less wide in proportion to the whole tower face than for the central bridge nodule of the multi-nodule tower type. 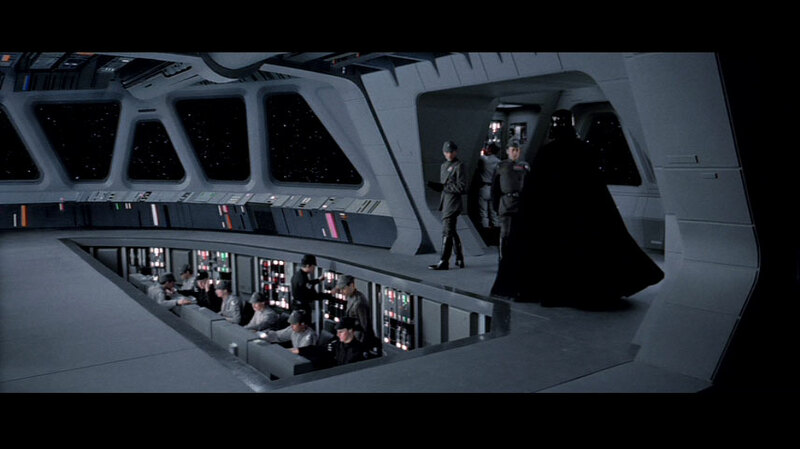 If so then either the Executor has a smaller bridge than the destroyers or else it has a larger tower. The latter possibility would be a problem because it could have the effect of making the Executor significantly longer than the eleven to twelve miles indicated by the other geometric studies. If the Executor's tower was significantly larger than the ISD's then we would expect it to contain a greater number of decks and therefore show a greater number of rows of portal lights. Fortunately it turns out that the portal lighting of the front faces of the star destroyer and Executor bridge towers are essentially identical with the exception of the nodules' panoramic windows. The decks must therefore be spaced and laid out in almost exactly the same way in each vessel, and the tower faces are the same size. This evidence is supported by an examination of the structures on the side faces of the bridge towers. The sides of the tower feature what look like small cargo bays and numerous other elements which clearly serve non-decorative functions. 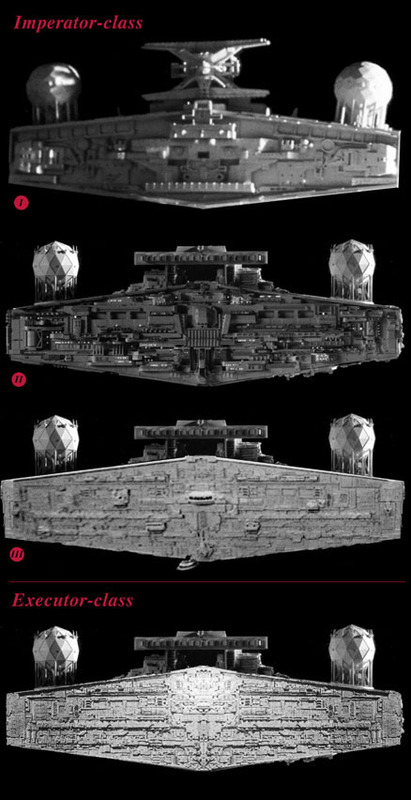 A side-by-side comparison of the Executor and later star destroyer towers shows that these features are precisely the same on both ships. These surface structures could not all scale up an down in exactly the same way as the whole tower. If the Executor tower were larger then we would have expected the functional structures on the sides to seem shrunken. This is not the case and the obvious answer is that the towers really are of the same size. In conclusion, the bridge towers of both classes of KDY-designed Imperial warships are identical in size. The actual bridge nodules themselves may differ slightly in proportion, at least in the exterior details. Bridges of the ships newer than the Devastator-type vessels feature two elongated pits set about 1.7m below the level of the general deck. The pit walls are lined with control panels and monitors, and six more duty station consoles are mounted freely in each pit. The crew and officers at these stations monitor and coordinate the overall functions of the ship. The commanding officers of the vessel stand on the walkways surrounding the pits at the normal deck height. There they are able to oversee and direct the pit activity when necessary while remaining sufficiently removed from the clutter of mundane operations to be able to confer and observe the ship's situation external situation without distraction. At the Battle of N'zoth the stolen command ship Pride of Yevetha was shown to have similar crew pits in the fire-control centre, a secondary bridge coordinating the ship's gunnery. It seems probable that other secondary bridges also share the pit / command dual-deck layout. 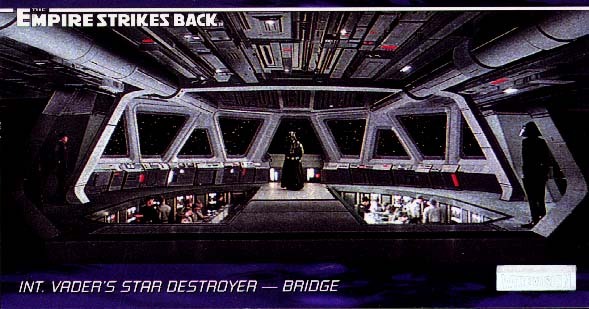 In The Empire Strikes Back there was a distinct difference between the layout of the main bridge crew pits of the Executor and the star destroyers. 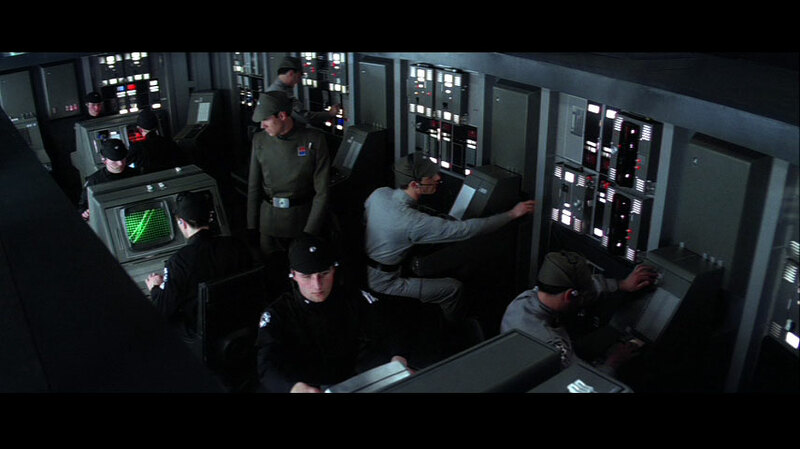 In each ship there were about six control consoles per pit. Aboard the Executor the consoles were aligned parallel to the command walkway, running fore-aft at the long edge of the pit. Aboard the smaller vessels the consoles were arranged in a fashion which is perpendicular to the walkway. 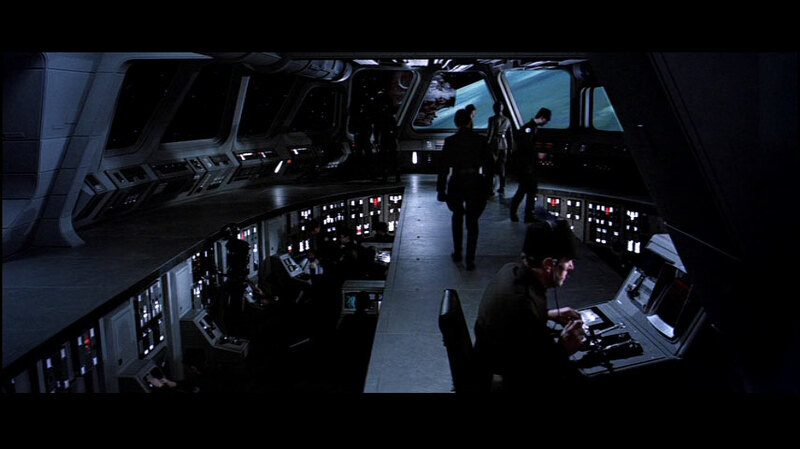 In Return of the Jedi the console arrangement of the Executor bridge had been altered. The consoles then duplicated the arrangement of the ordinary star destroyers. Perhaps this reflects a modernisation or standardisation of the bridge configuration when Lord Vader's flagship received servicing upon return to civilised space sometime after the Bespin incident. At least one extra console was added on the command level near the back of the bridge, near the exit. This duty station was manned by a crewman who monitored traffic around the Death Star construction zone and processed clearances for passage through the security deflector shield. The Executor only took up this extra function upon arrival at Endor (the job had previously been performed from a command station aboard the incomplete battle station). Therefore it is likely that this extra console was merely intended as an improvised and temporary addition to the bridge. In all ships each of the two crew pits is staffed by a minimum of: six crewmen (light grey overalls, olive cap); two subofficers (black tunic and pants, black cap, white shoulder emblem); one officer (olive tunic and pants, olive cap). Two naval guards are posted at the entrance to the bridge, and a variable number of technicians, subofficers and officers are stationed on the observation/command deck and nearby. 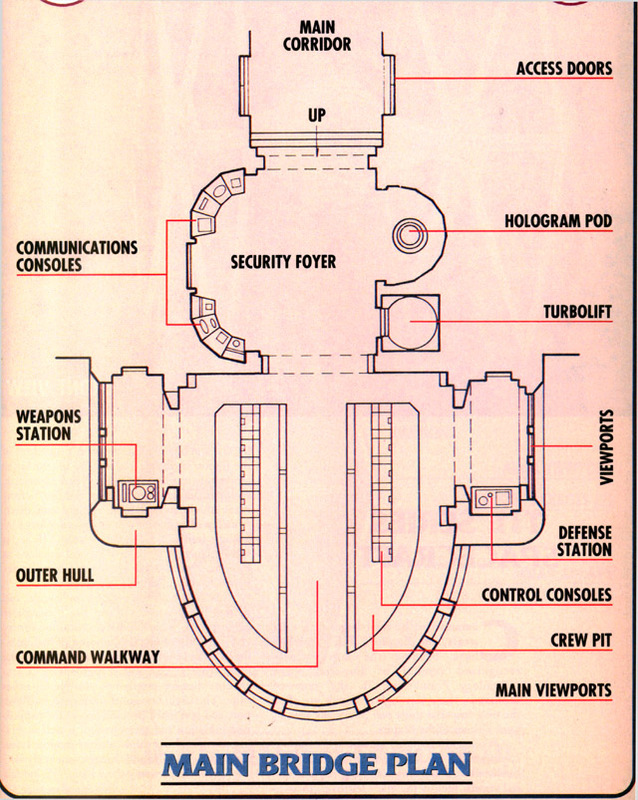 The consoles of the star destroyer crew pits are in rows perpendicular to the observation walkway. 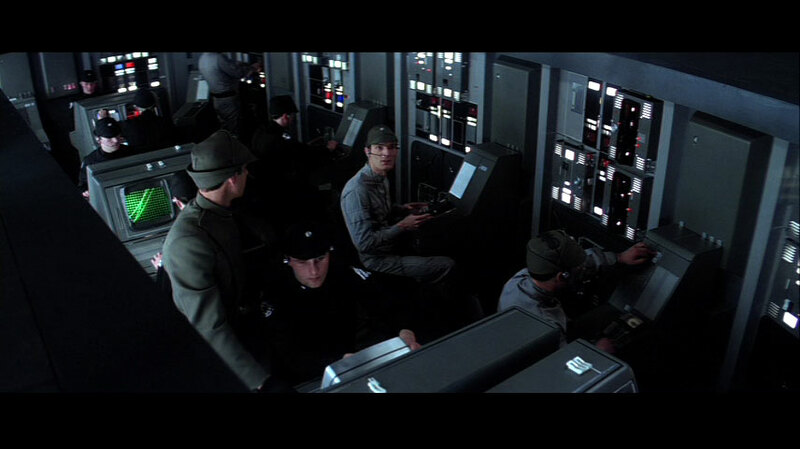 Consoles of the Executor crew pits were parallel to the observation walkway during the events immediately surrounding the Battle of Hoth. 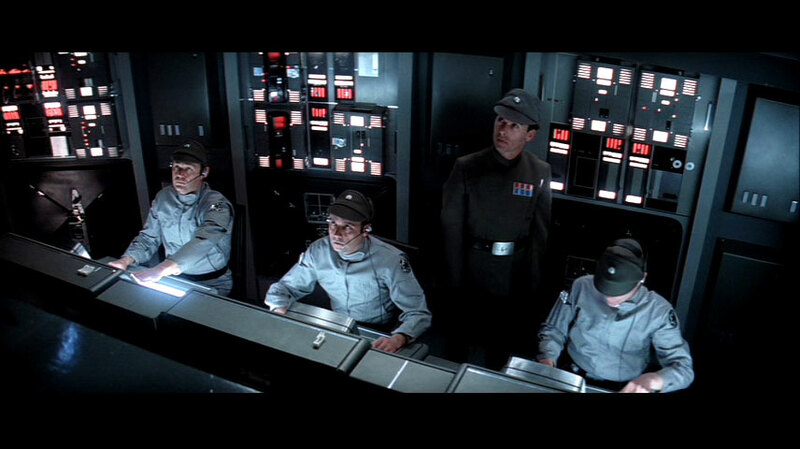 The rearranged and reconditioned Executor bridge for supervision of the security cordon at Endor. Plans for a nodular bridge in an Imperial warship, according to STAR WARS Technical Journal . STAR WARS Incredible Cross-Sections , David West Reynolds, DK Publishing Inc.
X-Wing Collector's CD , LucasArts. USS Alabama Memorial Park brochure , Mobile, Alabama, USA. Last updated 31 January 2004.